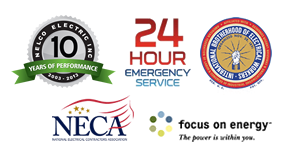 Since 2003, Nelco Electric has provided quality, efficient, and reliable services to all of our customers in Southeastern Wisconsin. As an owner-operated business, we understand the value of your hard-earned money and work dutifully to make sure you are receiving the best service possible. We are Reliable, Affordable, Licensed, Insured and ready to meet all of your electrical service needs.